Is The Bull Market In Stocks Nearing A Blowoff? 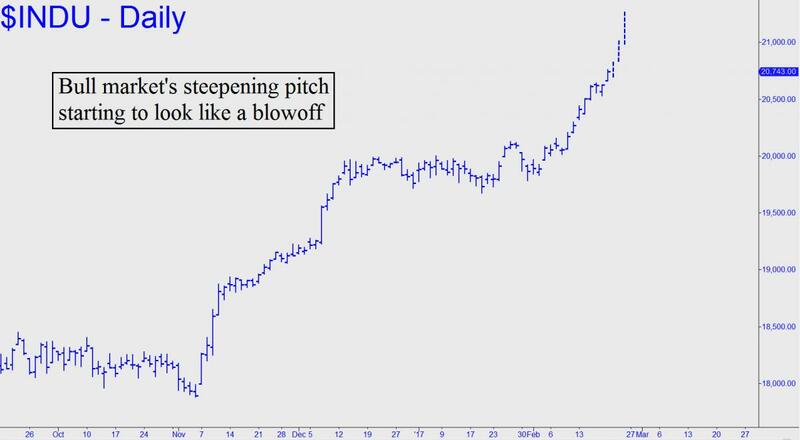 If the stock market’s wilding spree continues for just a few more days at its recent pitch, the rally is going to start looking like a blowoff on the daily and intraday charts. Rick’s Picks subscribers know something the bullish herd most likely does not, however, and that’s why we are able to watch the mania unfold without getting caught up in its mounting recklessness. Also, because we’ve held a very precise rally target in mind for quite some time, we’ve been able to stay comfortably on the right side of the Furies since late autumn. The target also promises to give us something to shoot at when we lay out shorts, as we so often do at swing tops. Will the next top prove to be something more than that? Or does Mr. Market perhaps have something more memorable in store to bring the thundering herd back to its senses? Time will tell, but the wait may not be so long as some Wall Street denizens might imagine. If you don’t subscribe, click here for two weeks' free access to Rick's Picks, including daily, actionable 'touts', round-the-clock updates, impromptu tech analysis sessions online, and a chat room that draws experienced traders from around the world at all hours of the day and night.